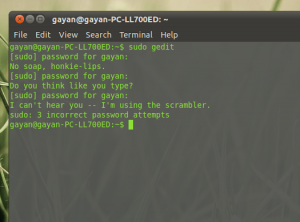 Unlike any other operating system, GNU/Linux has its roots hidden deep down inside one of the most basic user interface known as the Command-line or the Shell (which is actually a sort of a “emulation” of the original command-line interface). It’s true that most of the GNU/Linux users, thanks to major desktop environments such as KDE, Gnome, Xfce etc, have somewhat abandoned the command-line but if you give it a try (at least for doing certain tasks) you might even end-up loving it at the end :). Let’s take Ubuntu for example. It’s true that you can use graphical tools such as Ubuntu Software Center or Synaptic for installing software applications, but personally I find it really easy to use the command-line instead. Of course there are few drawbacks but one thing that I like about it is that it needs very little of your system resources to run. “You like them jokes? :)…! Anyway, both ‘su’ and ‘sudo’ are one of the primary commands that you’re gonna be needing while using the command-line as they let you execute programs with administrative privileges. So you see there’s thing trick that once enabled (sort of a Easter egg) throws jokes at you, whenever you fail to enter the correct administrative password. Quite simple actually. 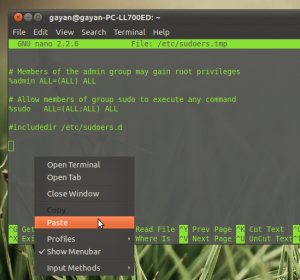 Just open your terminal and enter the below command first. Now this should open up the text editor in Ubuntu, scroll down till the end of the configuration file and paste the below command in a blank space. Update: Please use the below method to edit the “sudoers” configuration file and using gedit is certainly not a good idea (although it worked for me) which I realized thanks to “Alan” (see the below comment, dude btw, you’re the first commenter in this blog!). This is a sensitive configuration file so the below command seems to be the official way of editing it. 1. First open that configuration file using the below command (it opens the file in the “nano” command-line text editor). 2. Now, just use your “down” arrow key on the keyboard and go to the very end of this file. Just copy the below code and simply right-click on the window and choose “paste” for pasting the code. 3. After that press “ctrl” + “o” keys (that’s the letter “o” not zero) which should bring a message as shown below and then press the “enter” key. 4. Now press “ctrl” + “x” and it should exit the text editor. That’s it. Now every time you make a mistake while entering the administrative password, the Terminal will throw jokes at you, a lot of ’em (if you want the audio edition, make sure to turn on the speakers!, Kidding :D). Hey thanks man!. I updated the post… seriously it's right on the top and I didn't see :/, I'm a hecticgeek for sure. Again, thanks.